The $13M Pan-Canadian NSERC-CMIC-funded Mineral Exploration Footprints project is nearing completion. The project and preliminary results are summarized below and interim publications can be accessed on the Footprints website. 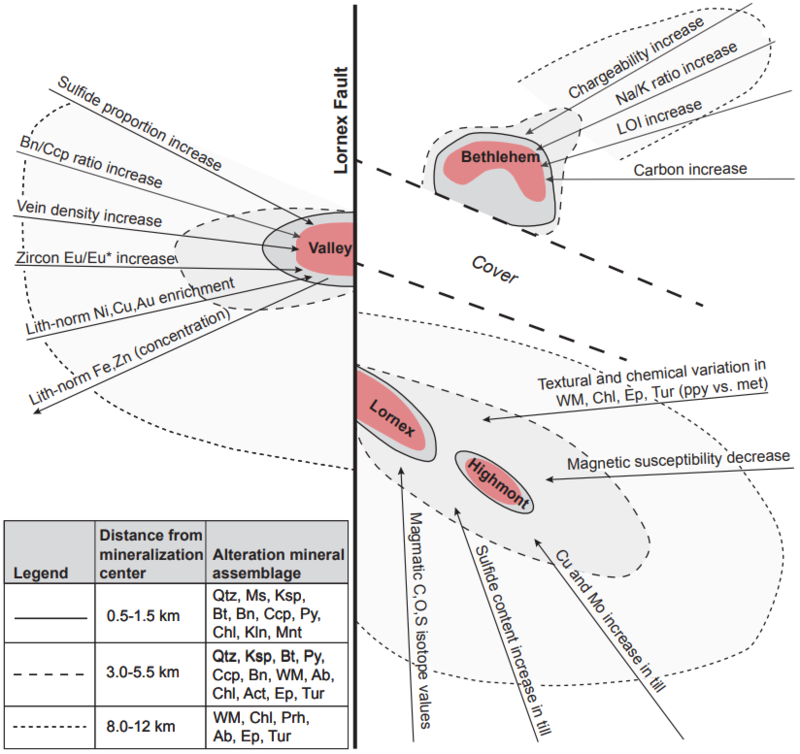 To develop new approaches to ore system modelling using more effective integration and visualization of multi-parameter geological-structural-mineralogical-lithogeochemical-petrophysical-geophysical exploration data using GEOSCIENCE Integrator®, self-consistent GOCAD® 3D Common Earth Models, and geostatistical/machine learning technologies (e.g., clustered heat maps, K-means clustering, self-organizing maps, Hypercube). Figure Caption: Schematic map of Highland Valley area showing preliminary footprint components and vectors observed at all deposits. Ab: albite, Act: actinolite, Bn: bornite, Bt: biotite, Ccp: chalcopyrite, Chl: chlorite, Ep: epidote, Kln: Kaolinite, Ksp: K feldspar, Mnt: montmorillonite, Ms: muscovite, Prh: prehnite, Py: pyrite, Qtz: quartz, Tur: tourmaline, WM: white mica; ppy: porphyry, met: metamorphic/deuteric alteration (from Lesher et al. 2017 Exploration ’17). The project is being led by Professor Michael Lesher at MERC/HES and Professor Mark Hannington at Ottawa/Kiel and involves 24 universities, 29 faculty researchers, 15 mining and mineral exploration companies (Agnico-Eagle, AngloGold Ashanti, Barrick, Cameco, Denison Mines, Franklin Geosciences, Gold Fields, HudBay Minerals, Iamgold, Kinross, Orano, Teck, Yamana Gold), 4 geochemical service companies (Actlabs, ALS, SGS, SRC), 5 geological and geophysical service companies (Abitibi Geophysics, CGG, DGI, PGW, SRK Consulting), 6 software service companies (Geosoft, Geovia, MIRA Geoscience, Paradigm, Pitney-Bowes, Reflex), and 4 collaborating agencies (Geological Survey of Canada, Ministère des Ressources naturelles du Québec, Saskatchewan Geological Survey, Geologic Survey of British Columbia). It has trained 15 post-doctoral fellows and research scientists, 9 PhD students, 16 MSc students, 6 BSc Honours students, 17 BSc laboratory assistants, and 17 BSc field assistants. Thus far 98 vectors (35 in metasedimentary rocks, 63 in mafic dikes), 20 footprints (9 in metasedimentary rocks, 11 in mafic dikes), and 4 halos in Quaternary sediments have been identified at the Canadian Malartic stockwork-disseminated Au deposit; 18 vectors and 7 footprints have been identified at the Millennium unconformity U deposit and 14 vectors and footprints have been identified at the McArthur River unconformity U deposit; and 15 vectors and footprints have been identified in the Highland Valley porphyry Cu system. For the first time, these have been assembled into comprehensive models that will serve as landmark case studies for data integration and analysis in today’s challenging exploration environment. 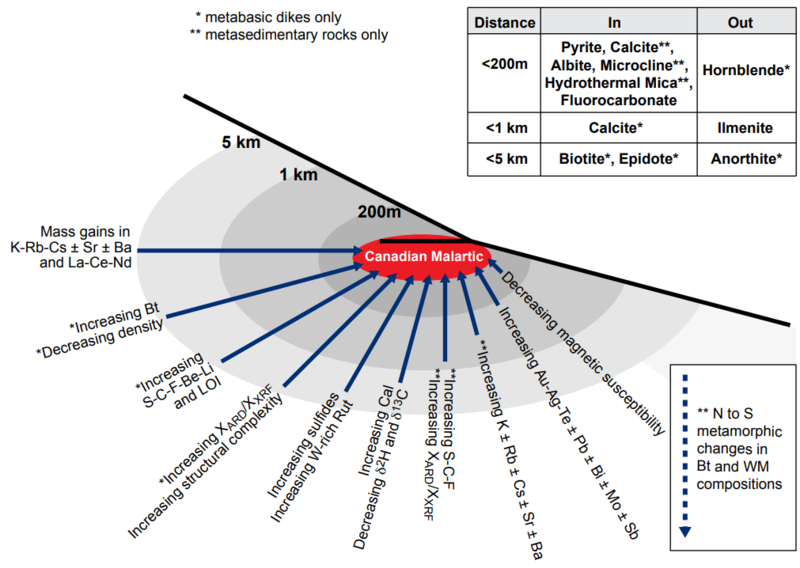 Figure Caption: Schematic map of Canadian Malartic area summarizing some of the footprint components (upper right) and vectors in the Pontiac Group. Bt: biotite, Cal: calcite, LOI: loss on ignition, Rut: rutile, WM: white mica, XARD: abundance in aqua regia-digested sample, XSPF: abundance in sodium peroxide fused sample, where X is Fe-Mn-Mg-Al-Ti-K housed mainly in biotite (dissolved by aqua regia). (From Lesher et al. 2017 Exploration ’10). The 5th and final Annual General Meeting was held during PDAC and several presentations will be made at the upcoming CIM-GAC-MAC Resources for Future Generations meeting in Vancouver, BC 16-21 June and the Society of Economic Geologists Metals, Minerals, and Society meeting in Keystone, Colorado 22-25 September 2018. The final report will be completed at the end of the summer and after a 6-month blackout period all project results will be available to the public through the project website. For more information you may visit the project website below or contact Professor Michael Lesher at mlesher@laurentian.ca.